Wakatobi is a luxury dive resort in southeastern Sulawesi, Indonesia. In a tranquil island setting far from crowds and cities, with no other divers for at least 100 miles, Wakatobi seamlessly blends five-star amenities and civilized comforts with a pristine natural environment; a pairing that has secured its reputation as one of the world’s finest resorts. Whether you are diving or snorkelling amongst our vibrant protected coral reefs bristling with marine life, enjoying a rejuvenating spa, taking in a glorious sunset with your favourite cocktails at the jetty bar, or perhaps indulging in a romantic beach dinner, Wakatobi Dive Resort provides a unique and enriching experience for those seeking recreation, relaxation and privacy. Gangga Diver’s PADI Five Star Dive Center is run by International dive instructors. 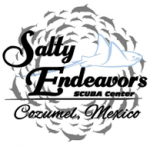 Qualified guides and dive masters pride themselves in offering very personalized diving service to suit and divers of all levels of experience. The dive center provides racks for each room to store equipment and has toilet and shower facilities with hot water- perfect for after those night dives. 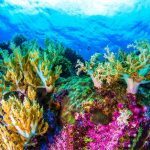 Indonesia is preparing a regulation in an effort to improve sustainable coral reef management given the upcoming World Coral Reef Conference (WCRC) in Manado, North Sulawesi, between May 14-17, 2014, a minister said. “For the substance of the conference, Indonesia as the host country is preparing a regulation for sustainable global coral reef management,” Marine and Fisheries Minister Sharif Cicip Sutardjo said here on Saturday. The minister noted that the regulation is being prepared because of concern about the condition of the increasingly degraded world coral reefs. According to him, coral reefs in Indonesia are the best in the world and, therefore, they should be protected with a regulation. The rehabilitation of Indonesia’s coral reefs will receive more than US$62 million of additional funding from the Coral Reef Rehabilitation and Management Program – Coral Triangle Initiative project. Washington DC – infoZine – The World Bank’s Board of Executive Directors approved US$47.38 million in financing for the project – the conclusion of a three-phase program which began in 1998. The Project is also supported by a US$10 million grant from the Global Environment Facility (GEF), and the Government of Indonesia has pledged US$5.74 million for the 5-year project. Of course diving must be fun! So whether on day-trips or safaris, we make sure you will enjoy all of your time with us – and still stick to high international standards of safety and service. At the same time, we keep our prices good and give our best to you – and we never cut corners, we simply believe in giving you great value. Hundreds of satisfied customers will agree with this, please have a look at our report on Trip Advisor! Diving in Komodo Island with Komodo Aqua Diving !! Diving Komodo in Indonesia with Komodo Professional PADI/SSI Divers should be get in the list things to do in Indonesia, because Komodo Island stands one among the best dive sites in the world. The abundance of Pelagics, Manta Ray, Sharkcritters and macro fishes, Pigmy Seahorse, Frog Fish the dazzling colours and diversity will make diving Komodo truly unforgettable experience while you are in Indonesia. Let us take you to Komodo Snorkeling Tour, Komodo Daily Dive Trips or even for multiple days Komodo Dive Packages. Komodo Aqua Diving will make sure of your safety for Diving Komodo, whether you are beginners diving, certified divers or you are looking to earn your Diving Certification. Finned right shoulder along a sloping wall down to 30m. Nice green turtle, chinta nudibranch, jawfish, crocodile fish, banded sea crate, black/yellow flatworm, 2 cuttlefish (male and female (laying eggs). the female can lay up to 400 eggs every 5 mins – phew! This was a brilliant dive and I thoroughly recommend Wakatobi! Dropped down a vertical wall that fell to 60-70m. Wall encrusted with corals and huge gorgonia sea fans (nut no pygmies! 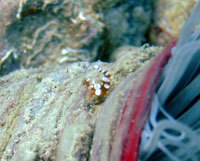 ), big moray, lion fish and nudbranchs. A big napoleon wrasse cruised out in the blue at about 35m. Big crocodile fish, pink scorpion fish and juvenile lion fish. Tuna and barracuda joined us out in the blue. Wonderful dive! Dropped onto a a ‘coral bowl’ dive site with a centre sandy bottom. Garden eels in sand with a single anenome in the middle with a harlequin crab. Schools of beautiful and playful batfish (but with parasites on their faces). Crocodile fish, nudibranchs, saddleback anenome with clownfish eating bubbles! Pyjama cardinal fish, spine cheeked anenome fish, floured and spotfin lionfish.